Walking back to their apartment late one night a tragic encounter sees Sam murdered and his beloved girlfriend Molly alone. Sam is trapped as a ghost between this world and the next trying to communicate with girlfriend Molly through a phoney psychic, Oda Mae Brown, in the hope of saving her from his murderer. 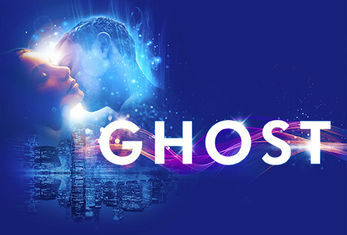 The movie Ghost has proven to be one of cinema’s biggest all-time hits. Starring the late Patrick Swayze, Demi Moore and Whoopi Goldberg, it was the highest grossing film of 1990 and won an Oscar for screenwriter Bruce Joel Rubin who has adapted his screenplay for this musical. The movie and the musical feature The Righteous Brothers’ Unchained Melody alongside many more terrific songs co-written by Eurythmics’ Dave Stewart. Dave Stewart is recognised as one of the most respected and accomplished talents in the music industry today. Stewart's career spans more than 25 years and more than 100 million album sales. With Eurythmics partner Annie Lennox, Stewart delivered pop/rock hits such as Here Comes the Rain Again, Who's That Girl, Would I Lie to You?, Missionary Man and Sweet Dreams (Are Made of This). In 1999, the duo was honoured with a Lifetime Achievement Award at the Brits. Together with Mick Jagger, he wrote and produced the score for Alfie, starring Jude Law, which won the pair a Golden Globe for Best Original Song. Stewart has won Best British Producer four times and Best British Songwriter five times as well as numerous Grammy, MTV and European awards.